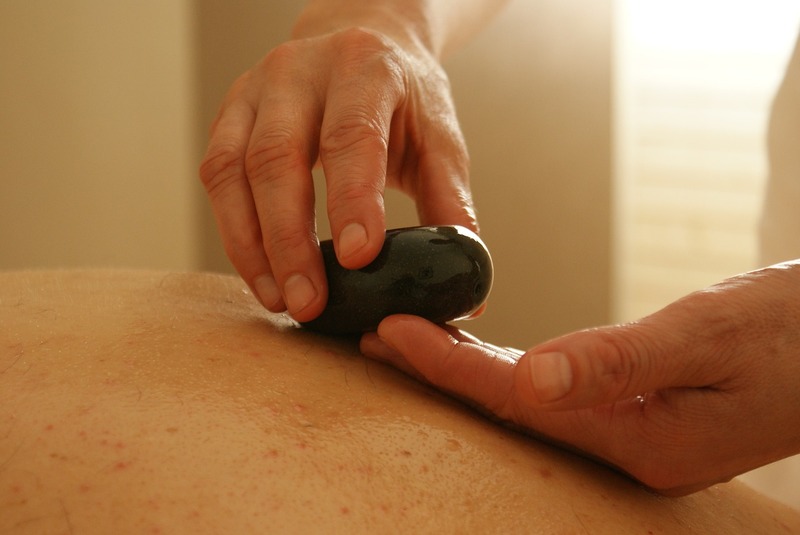 Hot stone massage is a form of massage where the massage therapist uses smooth, flat, heated stones. The stones warm up tight muscles and relax them. This gives the massage therapist the ability to work on other parts of the body. They are placed on specific pressure points, and as the areas are warmed and relaxed, it allows the therapist to apply deeper pressure without discomfort. The stones used are usually made from basalt river rocks. These rocks are specifically used because they are smooth and retain heat well. The stones are heated to a precise temperature range between 110 and 130 degrees Fahrenheit. Anything over this temperature can cause burns. The stones can be placed in many locations, including bilaterally along the spine, on the chest, stomach, face, palms and even between the toes. Hot stone massage is often described as deeply relaxing and comforting. It is particularly beneficial for people who are chronically cold. This type of massage is frequently used to treat the mind, as well as the body and can even help with depression, anxiety and insomnia. There are many benefits to hot stone massage. The heated stones definitely help ease muscle pain and tension, which increases blood flow, while also reducing muscle spasms and increasing flexibility. When muscles are relaxed and tension is lessened, stress and anxiety are decreased. This can lead to better sleep. Studies show massage can lessen the need for sleeping pills, as well as prescription pain medications. While hot stone massage can be beneficial for most, certain types of people should not partake. People with conditions like high blood pressure, heart disease and epilepsy may actually experience adverse reactions. This is particularly a concern with diabetics and those suffering from neuropathy. Diabetes affects how the blood vessels and nerves function throughout the body, and especially the fingers and toes. People with diabetes and neuropathy can lose feeling in their extremities, which means they may not be able to feel an injury or a burn. Pregnant women might also want to avoid hot stone massage, as it can be uncomfortable. It is not uncommon to feel some soreness and muscle achiness the day after a hot stone massage. This can be caused by the deep tissue manipulation and strong pressure that is applied during the massage. Overall, the experience of hot stone massage should not be painful. Your body will most likely thank you for the positive attention. This article was posted in Massage and tagged flexibility, hot stone massage, pain, tension. Bookmark the permalink. Follow comments with the RSS feed for this post. Both comments and trackbacks are closed.